Africa, to the wider TV audience, means the big game parks of the East, the varied attractions of South Africa, like the Cape and, not so long ago, the wonders of the Nile in Egypt. But in fact most of Africa is still a dark, unknown continent, where in so many ways little has changed. Isolated villages of straw-roofed conical houses dot a dry scrub landscape as drums echo across the endless plains after sundown. Dark forests of tall trees disected by a quiet sluggish river; cicadas deafening at dusk. Eerie outcrops and tall turrets erupting from a Saharan sand dune, where the stars are overwhelming and the silence piercing. Animated, colourful traders in a dusty market shaded by a giant baobab tree or wild-eyed Tuaregs guiding a salt-laden camel caravan across an endless horizon. It takes a significant amount of planning, and increasingly more than the average ‘budget’ travellers’ resources, these days to get some parts of Africa. We were lucky to cross Africa overland since the 1970/80s and as recently as 2010 in our Land Rover. Places now off limits enthralled us: countries like Algeria, Mali, Niger, Congo-Zaire and South Sudan. Sadly today’s adventurers may struggle to ever get to these places. And yet there are some places, formerly unsafe, that are now on the radar of some contemporary explorers, like those here today perhaps. More a pictorial adventure, this program will take you to some of those places. We begin this mixed bag in the Horn of Africa: Djibouti, Somaliland and the Danakil of Ethiopia, where one of the most astonishing sights of Africa is the boiling lava lake of Erta Ale. In central Africa we’ll take you on a short trip to the Central African Republic, Congo-Brazzaville, Congo-Zaire and Angola (a more recently accessible country). 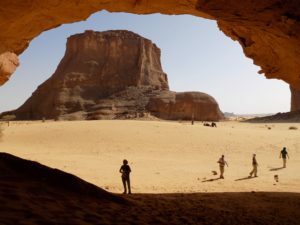 Our main programme will take you into one of the most underrated and surprising countries of Africa – Chad, where the Tibesti, Ennedi and Borkou regions have finally become safer than anywhere else in the Sahara. Isn’t that a big surprise! That’s the enigma of Africa: unknown places that one day may capture a new audience. My name is Maria Angelina, Master Management Student of Petra Christian University, Surabaya, Indonesia. Currently, I am doing a research as a part of my postgraduate thesis entitled “Backpacker Travel Decision and the Effect of Travel Country Perceived Risk in Indonesia”. All the information given would be kept confidential and would be used for the academic purpose only.